Oh my. There was a baseball game played in Boston last night that was one for the ages. Washington’s two young phenoms put on a clinic as Stephen Strasburg struck out 13 and Bryce Harper pounded three hits including a mighty 420 foot blast to the deepest part of one of the most revered places in the game- Fenway Park. Sometimes, words are completely inadequate in capturing the history and drama of a given event. But the promise of the future and the remarkable nature of what occurred last night seemed to bring out the poet in members of baseball’s writing community. Besides history, the game produced two of the best written articles you’ll ever read that captured every bit of it. The Washington Post’s Adam Kilgore really outdid himself. Here’s the piece in its entirety and worth every second of your investment. This is but a taste. 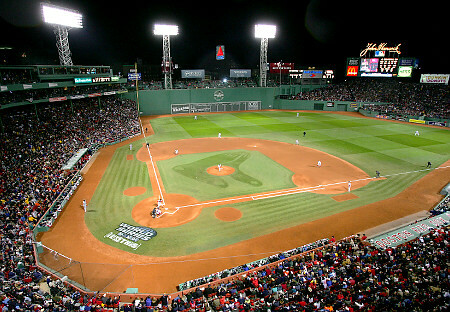 A century’s worth of players have passed through Fenway Park, where history seeps through the emerald walls. Stephen Strasburg and Bryce Harper graced the cathedral for the first time on Friday night, and they did not dissolve into its annals. They made them richer, more complete: The old yard can say it bore witness to Strasburg and Harper at their unbridled beginning, the moment in time when the Washington Nationals became something fresh and different. Two of the most arresting players in baseball spearheaded the Nationals’ assault on the Boston Red Sox in a 7-4 victory. Harper, the 19-year-old without an off switch, went 3 for 5 with a double, three RBI and a 420-foot, two-run home run. Strasburg, pitching on the two-year anniversary of his masterful debut, threw his first 100-mph fastball of the season, struck out 13 over six innings of four-hit ball and escaped a bases-loaded jam by throwing a 3-2 fastball with his 119th and final pitch. It was their first visit to Fenway. And as evidence of how much trouble is brewing for the rest of baseball with these two kids- the bigger the moment, the better they play. They seize the spotlight with flair and greatness. They both have a deep understanding and appreciation of the history of the game. Harper said he was awestruck thinking he was hitting from the same batter’s box as Ted Williams. Strasburg pitched his second best game ever, surpassed only by his major league debut, another one of those moments he seized two years ago to the day. ESPNBoston.com’s Gordon Edes is also in fine voice this morning. Impressive to me on a number of different levels, is that this is a Boston Red Sox beat writer waxing poetic about a visiting team. But history is history, and a good reporter and a good writer knows when sublime drama eclipses such mundane things as rooting interests. Strasburg, featuring a fastball that touched 100 mph, a changeup that violated the laws of nature and a curveball bereft of compassion, struck out seven Red Sox in a span of eight batters. There’s no telling how many strikeouts he might have finished with if his pitch count hadn’t climbed to 119 with nine outs to go. “I knew I was up there, but I had so much adrenaline being at Fenway for the first time, it didn’t really matter,” Strasburg said. Both Kilgore and Edes point out that the only other 19-year olds to hit homers in Fenway Park were Mickey Mantle, Al Kaline and Robin Yount- all hall-of-famers. The only 19 year-olds to collect three hits at Fenway were Kaline and Ken Griffey Jr. There are not enough superlatives to describe the sheer wonder of what we are seeing with this baseball team from the nation’s capital. The last time they were this good was in the 1920’s when they won their only World Series behind the arm of the Big Train, Walter Johnson. But this squad has two players for the ages. And I might add, in Davey Johnson, one of the greatest managers and baseball men the game has ever seen. I am astounded I have actually lived long enough to witness something so pure and amazing and rare. May we all savor and treasure it and appreciate the incredible good fortune the fates have conspired to give us. Some of the greatest players in the greatest game ever devised have somehow managed to land on our doorstep, in a town that has seen nothing but baseball futility for well over 80 years. Man, great read. Something special definitely happened last night at Fenway.